Custom kitchen cabinets or any custom made furniture or article have that certain touch of individuality. Items are made specifically to your requirements, whether it be the height of your cupboards, different width sizes to standard, door and drawer fronts of your own design or simply unusual worktop materials. My son Paul for instance made his worktops with ¾"; external plywood, edged in oak trim and used large floor tiles for the waterproof surface. He had to reinforce between each unit with 1" section hollow steel square tube to prevent any sagging of the plywood which minimised the chance of the tiles and grout cracking. Standard cabinet heights, inclusive of the worktop are approximately 36" but this height is not suitable for everyone and his dog. Made to measure Custom kitchen cabinets solve the problem. When reducing the height ensure that white goods, washing machine, drier, small refrigerator will still fit beneath the worktops, otherwise they will have to stand alone. Doors, drawer fronts and end panels can be engraved in any design you fancy, animals, country scenes, even goldfish playing in a pond. The designs are endless. The designs and programming for these engravings to be produced on a CNC lathe can be quite expensive to produce but one thing is sure... They will be totally unique. Custom cabinets can add so much to a kitchen. From modern textures, hardware and finishes, to those that are more traditional, the right cabinets will bring this important room of the home together. However, building custom kitchen cabinets is probably not a task for the beginning woodworker. There is a huge level of skill and knowledge required to create a set of cabinets that are made individually, fitted perfectly and last for years to come. If you feel you have the knowledge and expertise to design and build your own dream kitchen then here are a few tips. Any type of woodworking project will require exacting measurements. This is never more true than with custom kitchen cabinets. Even the slightest measurement that’s wrong can completely throw the entire project off. It can be quite costly to fix, as well. Get your measurements right the first time and you’ll save yourself a lot of time, money, and headaches. The choice of materials is critical. Not only will it affect the appearance of your custom kitchen cabinets, it affects almost every other factor, as well. Your budget will obviously have a direct impact on what type of materials you will use. Remember that you will need some space to work with large sheets of materials and the partially completed cabinets. You will also need hardware, such as hinges, drawer slides, pulls, and other components that will really set your cabinets apart from others. When looking for hardware, don’t just limit yourself to what you can find in the store. Building surplus stores can lead to antique hardware that may be the perfect compliment. Handles and pulls can be created from various pieces of stock. Use your imagination if you’re happy with what you find in traditional hardware. 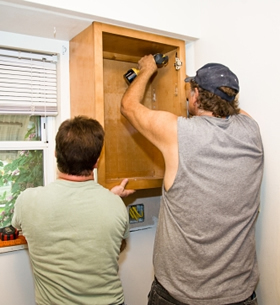 When you’re removing the old cabinets, make sure that you don’t remove sections of the wall with them. This is a common occurrence and it can be quite expensive to fix. Always unscrew existing cupboards from the wall and remove shelves and doors beforehand. You will want to make sure you have enough hands available to help you,cabinets can be very heavy. You will also need to have all the tools available for the dismantling and be proficient in plumbing and electrical work. Also, make sure you allow enough time for the installation, too. If you are rushed, mistakes are likely to be made. Many people who tackle custom cabinet making find that it’s not as easy as they might have expected. There are so many variables to consider and it does take a lot of time. Careful planning and preparation is essential to success, whether it is in the design, the choice of materials, or the availability of tools. Also be aware that you will need the services of a plumber, an electrician perhaps, a wall tiler maybe and a plasterer if your walls are badly uneven. Have A Great Or Sad Story About This Topic? Do you have a great story of your experience when building the kitchen of your dreams. Share it! If it's embarrassing I will alter your name, if you so wish. The page you submit will be your own web page, for you and your family and friends to admire.